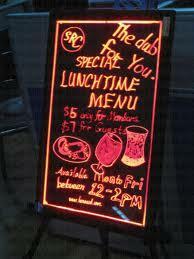 LED writing boards is an led illuminated rewritable signboard which lights up the messages. It is a writing surface on which messages and advertising can be done with fluorescent pens. Without any personal contact , phone calling, door to door sales one can convey his messages to thousand of people. Led consist of special lighting that when used in affiliation with fluorescent powder pens it gives mesmerizing eye popping effect. The best feature is its is a eco friendly and its content can be changed as little or often as one would like. In the world of new technology and invention LED writing board are most efficient and cost effective way for restaurants, shopping malls, coffee shops, bars, nightclubs and virtually any other public place etc to promote their business and sell a product which brings them a profit. LED Writing Board is an LED illuminated, rewritable sign board that lights up the messages. LED Board is provided with high performance, super bright LED's.These eye-catching, sparkling colored board, finished in a high quality, molded, non-fading black, Aluminum Alloy frame are excellent for Restaurant Menu Boards, Daily Specials, Discount Sales, New Product Releases, Stock Clearance Sales, Price Lists. Energy efficient with 100000 hours Led lifetime. Shopping malls, stores, supermarket, advertising and promoting for you. Ideal for advertising daily specials, drink specials, upcoming events or promotions. LEDTechShop, a unit of I Sustain Energy Pvt. Ltd. offers a wide range of LED and Solar products having diverse applications in residential lighting, commercial lighting, indoor and outdoor advertisements, and displays and so on. Our aim is to provide a high quality lighting solutions, innovative, environmental friendly products through trustworthy, reliable and user-friendly service to our customers, that are guaranteed to last while maintaining cost efficiency and thus generating more value for customers. Our R&D team is constantly working on to provide better, long lasting and eco friendly products for customers.